Now in the construction of this Joinery Bench I have made some different decisions about the bench top wrap. 1. This bench is made to travel, to knock down into smaller pieces so to easily and conveniently fit into my van and travel from demo to demo with me. I decided that to use soft pine again, like what I wrapped the Nicholson in, would be a mistake as there are many more bangs and bumps on the road. I wanted something "bulletproof" so I chose hickory. Not any hickory but a beautiful board of 1 1/2 inch thick 11 inches wide, straight grain and knot free hickory, This board was a thing of beauty. Still is beautiful, just in slightly smaller pieces now. 2. 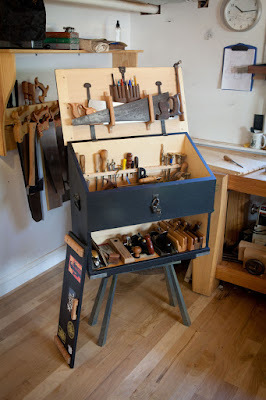 I want to put a tool rack in the back wrap of the bench to hold a variety of chisels, rasps, and marking tools so they're in quick reach for demos and convenient for use. 3. This bench will see more of the public than almost anything else I build will ever. So I guess it means more to me to show off a little on the piece. Therefore I'm actually pulling the trigger of the dovetails this time. 4. And probably he best reason of all, It has been way too long since I've had a project that used dovetails, I really enjoy cutting them, I find them challenging and intriguing, and good hand cut dovetails have always been to me, the sign of competence and skill in woodworking. So to use a skill, before I have to completely reteach myself the skill. It is time to dovetail. I really don't have a preference of pins first or tails first. I've cut the joint both ways and it makes no difference to me. If you align things correctly then there is no reason to have an issue anyway. I struggled with dovetails so much when I started woodworking. The thing that finally put it over the top for me was sitting down and constructing a set of saw guides. These helped me take my mind off the worry of making the cut and allowed me to concentrate more on how the joint should be constructed. I'm not sure what my block was but removing the worry of how to make the cut freed my mind and suddenly things all fell into place. I love the guides for what they did for me, but after several years of use, they definitely show their age, The cuts were not all crisp the last time I used them, the wood of the jigs had been worn away by the set of the saw's teeth. So after this realization I decided it was time to replace them or figure out how to move along without them. Well, I decided not to replace them, They still hang on the peg board of my shop, dutifully reminding me of where I came from, reminding me of a time when I couldn't saw a straight line without help. I moved on to cutting the joint more free hand. The wrap for the top is one of the best tests for that "guide-less" cutting that I've had yet. Even if I wanted to use the trusty old gauges, I couldn't. They were all made to fit over standard 1X boards. The hickory is 2X, so no dice on the gauges, and all the better for me. As I cut the dovetails I realize that I haven't completely decided on a "method of work" for doing this. I guess I'm still figuring it out, what works best for me. Sometimes I chop the waste away with chisel and mallet, sometimes I saw it out, sometimes I drill it away and then saw it away. I always use a small rasp to refine the fit, but I never do them the exact same way twice. 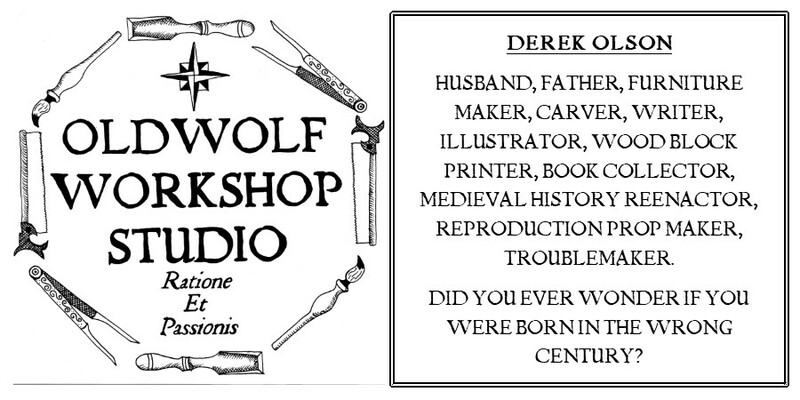 I'm not sure that I could convince myself that this makes me more versatile. Realistically I would say that it probably just makes me indecisive. Anyhow here is a series of pics from cutting these dovetails, I can guarantee next time it will be different, I guess as long as the results are consistent and satisfactory, I'm not gonna complain.